January 2019 marks the centenary of many important turning points in Irish history – the opening of the first Dáil and the start of the War of Independence. Less is said today about another event which dominated the press and the concerns of the ruling class at the time – the 1919 engineering strike in Belfast. This titanic battle of the Belfast working class saw 60,000 workers take strike action for one month. An estimated 750,000 work days were lost as a result. Electricity in the city was shut down to everything except hospitals, meaning no street light or trams. A strike committee of 130 workers held a massive say over what happened in the city. The capitalist press raged against this “soviet” committee. This movement happened in the aftermath of the First World War. The workers demanded a 44-hour working week in order to ensure that there would be work for demobilised soldiers. It happened at a time of global revolt in the wake of the Russian Revolution. It was part of an upsurge in working-class struggle across Ireland, epitomised by the Limerick soviet. It was interlinked with industrial strife in Britain, which saw 35 million working days lost to strikes that year. 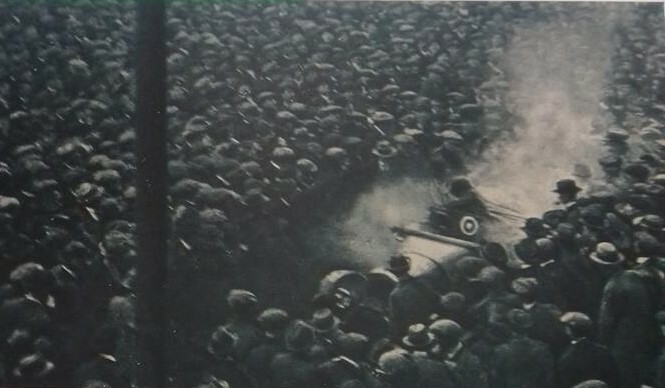 It was particularly linked with the Glasgow strikes for a 40-hour week, led by socialists, which was brutally repressed using the army. The strike went way beyond workers in the engineering firms, shipyards and the gas and electricity stations. It saw graveyard workers, crane and linen workers join the action in solidarity. At every stage, it was driven by ordinary workers taking action and forcing union leaders to move. When the Belfast strike leaders took a step back from action and organised a ballot to retreat, workers voted to reject this move. But, smelling blood, the capitalist establishment sent in troops to ‘protect’ scab labour and break the strike. The leadership refused requests to escalate the action, particularly by not accepting the offer of railway workers to take solidarity action. The weakness in the strike came not from the resolve of workers themselves but the nervousness of the leadership to step up the fight. The strike itself showed the potential to unite working-class people across the sectarian divide. For example, the largely Protestant workers involved selected a Catholic as the chairperson of the strike committee. 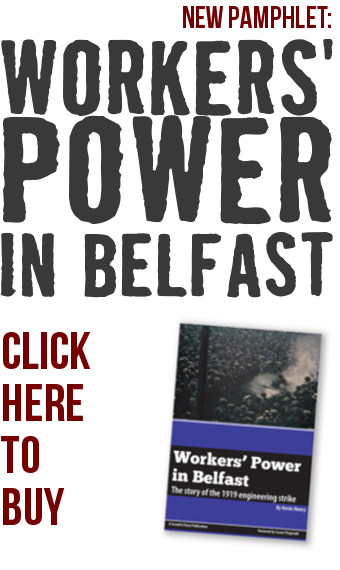 Even after the strike ended, its effect on the Belfast working class was clear. 100,000 marched on May Day that year, demanding a 44-hour working week and calling for labour representation. The following year, 13 Labour candidates were elected in Belfast, 5 of them strike leaders. The tragedy of that period was that a mass socialist force wasn’t built and sectarianism later reasserted itself, particularly with the 1920 pogroms in the workplaces and then partition. Many of those kicked out of the workplace were labour activists, including 3,000 so-called “rotten prods”. This included the main strike leaders. The strike itself, however, shows that none of this was inevitable.